Our company, CineMassive, is hosting an event called the Minesweeper Super Challenge and we would love to get the Authoritative Minesweeper community involved. As a video wall company, we're always interested to see how games and applications will scale on our multi-HD displays. Recently, our team got the help of some great Minesweeper developers from this community to build a game big enough to fill a 24xHD video wall. To our knowledge, this is the largest Minesweeper game ever created. When set to “Expert” level, the game has a total of 38,799 mines. 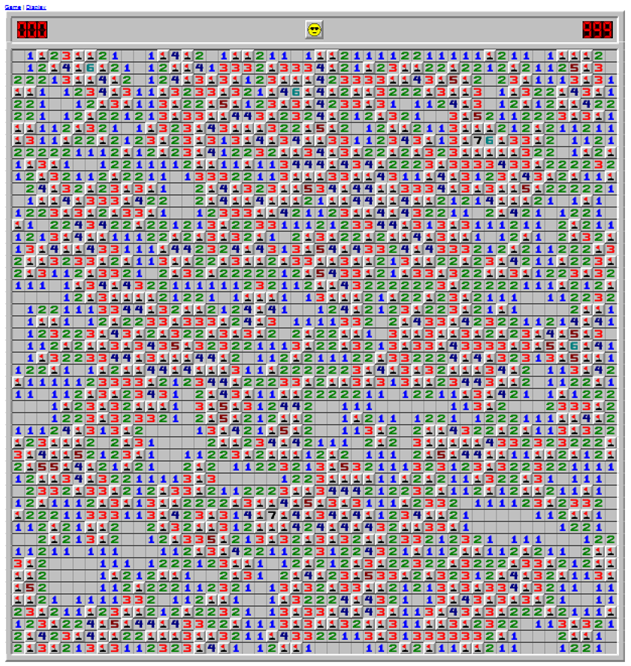 38,799 mines means 188,116 squares or a 262 by 718 board. At 30s per expert board (fastest time world record speed) it would take 3:16 to complete. At 60s per expert board (biggest board world record speed) it would take 6:32 to complete. At 100s per expert board (no risks, solve everything solvable without guessing) it would take 10:53 to complete. Density mode player. 32/33/80/135/196 = 476 mines. You can still try your luck with the biggest board that fits your screen. Thanks for sharing that list, EWQMinesweeper! Is there any way for us to contact them? We'd love to let them know about the event! First of all it's great honor to be part of that list with such amazing sweepers. Thanks, EWQMinesweeper. I would like to take part, although it will be so difficult. I'll send my application through your website, CineMassive150. 2. Will you stream all players? I would love to watch all of them. Guess I'm not the only one..
Btw big appreciation for the idea and effort. Last edited by Zlix on Thu Aug 13, 2015 7:03 pm, edited 1 time in total. I have two suggestions as well. 1. If you stream the event and we have breaks, it would be nice to have chat as well. This is not battle between us sweepers but battle all of us against the board. Support, advices, motivation etc. via chat would mean a lot. 2. If you want to maximize chance for solving that board(or at least to come very close), it would be nice after we all finish our games, to allow us to play all together. Lets say 3 attempts with player switches every 20-30mins or so. Hi Goran! Thanks for sharing your questions and suggestions with us - these are great ideas. We'll be reviewing all of the questions and recommendations we've received early next week, and we'll get back to you as soon as we have specific answers for you. Stay tuned! Thank you for taking my questions and suggestions into consideration. Hopefully, more sweepers will share their opinion as well. EWQMinesweeper wrote: You can still try your luck with the biggest board that fits your screen. I've done a 50x50 board on an online clone with 625 mines before (25% density), and I don't think I could make much harder with expert mine density (the biggest board that Minesweeper X can generate for my screen is 49x98). I have one question for coders: is it possible to have several sweepers playing simultaneously? With 10 sweepers playing simultaneously board could be finished more than 90% within 60-70mins. Zlix wrote: I have one question for coders: is it possible to have several sweepers playing simultaneously? With 10 sweepers playing simultaneously board could be finished more than 90% within 60-70mins. 4 or 5 years ago there was a version called co-op minesweeper where up to 8 players could play the same board at the same time. Contrary to its name there wasn't much cooperation because of a ranking system that awarded a player points based on how fast the board was solved compared to the record time and based on which portion of the board they solved. Common tactics were solving patterns close before other players, hunting openings and even distracting players by sticking close to their cursor. iirc it was run by someone from the russian Minesweeper community. The biggest boards had a few thousand squares but probably no more than 10k. Thanks for the invite. I applied using the form on the site. Before doing that, I read the Terms and Conditions and it states that only 3 attempts are allowed within the 12 hours. May I ask why? My only concern is that a player could experience a bad start. What I mean is, if a player clicks two squares at the beginning of a game and the second click is a mine, they've immediately lost one attempt before they've even started. Perhaps you could allow players a grace period of, say, 30 seconds at the beginning of each attempt in order for them to open up the board a little. Alternatively, you could remove that rule completely as I can't understand what purpose it serves. If a player begins his/her second attempt, the 12-hour deadline does not reset, right? - meaning they could make unlimited attempts within that 12-hour time window. @benjamin172: 50x50 with 25% density? How long did it take to finally finish a board? @DMarden: I agree, it would be cool to have a "minimum" time (something like 30-60 minutes) so that even if you get unlucky you can give it a good shot. Or else, 3 games, but a game only counts if you spend at least 1 minute on it. How much work would it be to implement co-op mode into version they are using? Are you guys interested in it? Is there active coder who could make it possible? One more idea crossed my mind, also require some coding. Instead of having 3 attempts, it may be better to have either 100ish lives, or 100ish undos(number can be agreed here), depending on what is easier to implement. qqwref calculated that we could expect 80ish forced guesses so 100 lives/undos could give a fair chance to 100% finish the board. I agree with "minimum time". qqwref wrote: @benjamin172: 50x50 with 25% density? How long did it take to finally finish a board? Zlix wrote: Hi guys it's Goran. Zlix wrote: I have two suggestions as well. Regarding your first question: My 1000 completed Intermediate games marathon was 8h20m long and the longest perioud between two solved boards was less than 3 minutes. It just takes good preparation. Have some snacks ready next to your desk, enough to drink and some music so that you won't lose your mind. A chat with other players would be nice but when playing myself I'd rather focus solely on the board. On the other hand having the chance to get input where to guess, should it actually be needed, would be awesome. CineMassive150 wrote: Thanks for sharing that list, EWQMinesweeper! Is there any way for us to contact them? We'd love to let them know about the event! Goran, Daniel and Michael already posted here in this thread and I just messaged the other 6 about this thread. Wow, I'm surprised how "small" these boards were. Well, might be because back then my screen was quite small. Afaik Mission Impossible was solved only two times. Bertie and I were part of the first team that solved it. I strongly disagree there should be only 3 attempts. With bad luck or misfortune you could be done in 5 minutes. Definitely discourages speed. There should be no attempt limit, just a time limit. I assume it has normal rules, and there is no code to prevent 50/50 guesses (eliminate luck)? I am on holiday the next 9 days, otherwise probably would struggle to find time, but could be fun preparation for Vienna! Thanks Fritz for spotting this. Last edited by EWQMinesweeper on Thu Aug 20, 2015 10:10 pm, edited 1 time in total. EWQMinesweeper wrote: You're welcome, Goran. I would agree with everything you say if you could try it over and over. On one time deal I would love to give myself highest possible chance to win. Don't forget that I'm NF player. I never play FL except on custom where time is irrelevant. My best FL is probably around 70ish sec. without marking every mine, so 90-100s is probably my max possible average speed. Playing at max speed for 10-11h straight without mistake is impossible imo. If rules remain as is I would probably withdraw my application so I don't waste someone else's chance. Chat was intended mainly for streamers. Player could join the chat while being on break.. Without breaks and/or stream chat is unnecessary. As of 3 attempts rule. When I read the rules I was sure it was not literally 3 attempts but 3 successful starts(if anyone remotely related to sweeping was part of the crew who made those rules). I registered, so hopefully will be selected. Imho, the most awesome version would be if they selected 10 players to co-operatively solve the board with unlimited attempts. It'd be much more exciting for viewers to watch, and give a greater chance of the board being completed. thefinerminer wrote: I registered, so hopefully will be selected. 20.625% density and forced guesses, since it's Minesweeper X. Would be too easy otherwise. Hi guys, I talked with some CineMassive representatives about this challenge. My understanding is they are still working out how the competition will work, and deciding on which rules would be most appropriate. One question which arose: How many guesses (after hitting an opening) would one expect when solving a 262x718 board with expert density? Has anyone done any research related to this, or do the sweepers who play large boards have an estimate? As a back-of-the-envelope estimate, the current largest solve with expert density was 60x118 and had two 50/50 guesses, both along the sides of the board. Assuming that most guesses occur at the side of the board, the expected # of guesses would be mostly proportional to the perimeter of the board rather than the area. Therefore one estimate would be to multiply the 2 guesses required for the current record by (262+718)/(60+118) = 5.5. This suggests that an 262x718 board would require about 11 guesses, so one would need to play the game about 2^11 = 2048 times before you could expect to solve it. If the expected # of guesses does turn out to be something like that, and that is deemed unacceptably high for a competition like this, I recall that freesweeper has a mode which removes guessing from the game. Currently it doesn't support such large boards, but perhaps Cryslon can remedy that. It even has a scrolling feature for large boards, which would allow people to compete on their own screens, rather than using CineMassive's screen. (This possibly was discussed, but I don't know if they intend to do it or not. Maybe play-at-home could be an additional part of the challenge.) Also, I just learned that MySweeper has arbitrary-sized boards and scrolling too. Here's another screenshot of a recently completed 60x118 board and a screenshot of one that I lost on the last 50-50 guess. The first had 2 forced guesses: On the left edge in the middle and about 10 squares below the counters window. Not sure how often I had to guess on the other board.